Cut tops off peppers just below stems and remove seeds. Fill 5 qt pot with1 inch of water and insert rack or steamer basket...bring to a boil. Place peppers, cut side down on rack, cover pot and cook for 4 minutes. Remove peppers and place cut side up in baking dish. Heat oil in skillet over medium heat. Add onion and garlic and saute until onion softens, about 3 minutes. Stir in zucchini tomatoes, seasoning and salt. Bring to boil, reduce heat and simmer 2 minutes. Stir in con..
Heat oven to 375°. Stir rice and 1/4 cup cheese into remaining veggie mixture. Spoon into peppers. Loosely cover dish with foil and bake 20 minutes. 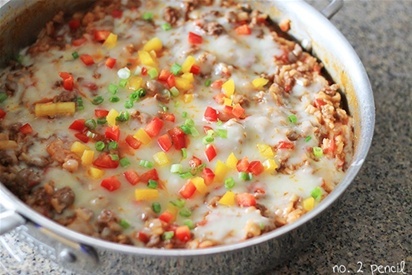 Uncover and sprinkle peppers with remaining cheese. Bake 10 min or longer until hot and cheese is melted. Saute peppers, onions and garlic in olive oil over medium heat. Once they have started to soften, increase heat to medium high and add ground beef. Season with 1 tsp salt and pepper. Once beef is cooked, add chicken broth, can of whole tomatoes (chopped up), tomato sauce and soy sauce. Bring mixture to a simmer, then stir in the rice. Cover pan and reduce heat to low, cooking for 20-30 minutes or until rice is tender. After 20 mins, stir pan ocasionally so rice does not stick. Preheat oven to 350°. Place bell peppers on a foil covered baking sheet with skin facing up and bake for 10-15 minutes,. Remove from oven and flip so that the hollow side is facing up -- place to the side. Meanwhile, heat olive oil aver medium high heat in large skillet. Add onion and garlic and cook until the onions begin to brown and soften about 3-5 minutes. Add the diced tomatoes and cook for another 3 minutes, then add the chicken stock, wild rice, and swiss chard. Stir and simmer covered about 45 minutes. Add to skillet mushrooms, ground beef and seasonings. Cook until pink is gone. Scoop the mixture into the peppers making sure to fill all the crevices. Place in oven and bake for another 10-15 minutes. Remove, cool for a few minutes and enjoy! Bring medium saucepan of water to boil. 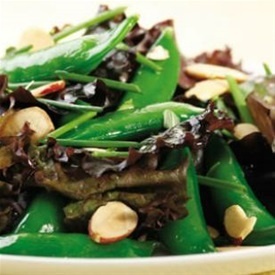 Add snap peas and cook until bight green but still crisp, about 1-2 minutes. Drain and rinse under cold water. Steam peas until crisp tender, about 4-5 minutes. Transfer to baking sheet lined with paper towel. Steam wax beans until crisp tender, about 5 minutes. Transfer them to baking sheet also. Refrigerate until chilled about 20 minutes. Whisk lime juice, oil, cilantro, salt and pepper in large bowl. Add radishes, peas and beans. Toss to coat. Serve chilled. Roast for 15 mins…stir in tomatoes, turn to oven and roast until veggies begin to brown, about 10 minutes more. Toss with oregano and serve.